Four couples from the USA, Germany, UK and the Netherlands are among the latest group of adventurers announced today as Jupiter’s Travellers. Mike and Alanna Clear have recently released their acclaimed film, Going The Distance, which was shown at last weekend’s Adventure Travel Film Festival in London. Buck Perley and Amy Mathieson are working on a book about their 2013 motorcycle journey around China. 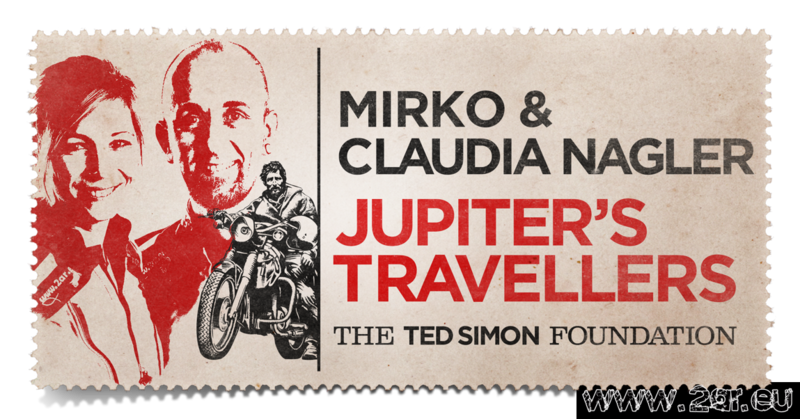 Mirko & Claudia Nagler are motorcycling for a cause in South America and Peter Scheltens & Leonie Sinnige are on a two-year round the world journey and currently heading north through Central America. Mahsa Homayounfar from Spain has visited more than 60 countries over the course of many different adventures and since November last year has been motorcycling solo in Africa and along the Pamir Highway. She has some remarkable and inspiring stories to tell. As do Ed Gill and Chris Beard, both of whom hail from the UK. Ed is motorcycling to Australia via the old Silk Road routes, while Chris is hitchhiking to India and making a film about the people and environmental issues he encounters along the way. As always, our congratulations and admiration go to all the new Jupiter’s Travellers. We wish you every success with your journeys and storytelling projects.